← Magic Johnson Talks About Writing A $50 Million Check! Diggy Simmons and J. Cole Throw Shots At Each Other…..Again! Earlier this year, Diggy Simmons released a diss record titled, ‘What you Say’, aimed at J. Cole after he heard a 2010 track where Cole subliminally rapped about hooking up with Diggy’s sister Vanessa while in college. [You can hear that here]. 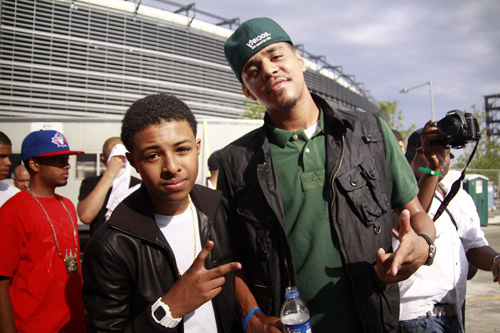 After the Diggy track was released, J. Cole stayed relatively quiet and the two called a truce back in July. “Sh-t ain’t gonna fly no more…J Cole…Diggy is family…Sh-t ain’t flyin! Now you whack, less than a man, mention me in verses. now it’s nightmares of a lil’ brotha dissin’ ya. ‘This verse may as well be a hearse, Killed you and ain’t even curse, n-gga’. This is all quite funny and ridiculous. If they were both on the same label, I’d call a conspiracy. Why is a 17 year old who grew up in the lap of luxury beefing with anyone? And why won’t J. Cole go and pick on someone his own size? This entry was posted in Celebs and tagged Beef, Diggy Simmons, hip hop, J. Cole, rap, Verse. Bookmark the permalink.